Back in December while visiting my family in Calgary for the holidays, Michelle and I were treated to some dinner at Essence of Saigon Garden Restaurant in NW Calgary (across from Northland Village Mall). It was really cold that day, the restaurant was full (around 6:30pm on a Friday night) and there was a small line-up of people huddled just inside the door waiting for a table. it’s a small restaurant, but it was a great sign to see that it was so busy. 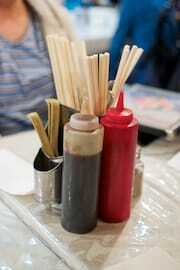 We were greeted right away and it wasn’t too long before we were seated – efficient and courteous service. 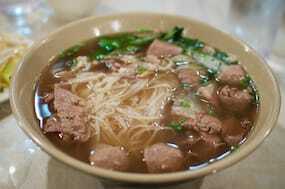 I ordered #1 – Essence of Saigon Special Pho (well done brisket, rare steak, beef ball, tendon & tripe – large for $9.50). The broth was very dark in color and had a strong beef flavor – overall an above-average broth that wasn’t too oily/greasy and served as a very good base to the soup. One of the beef balls tasted a little old (like it had been sitting in open air for too long), but only one of them. Also, the soup could have had a lot more tendon and tripe for my preference, but it was still delicious in spite of that shortcoming. Overall an above-average bowl of pho though, and very enjoyable. 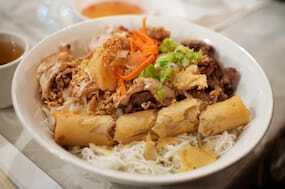 Michelle ordered #25B – Special Rainbow Vermicelli (charbroiled beef, chicken, tiger prawn & spring rolls – $11.95) which I ate more than half of. The chicken was too dry, the beef had no grill marks or charring and wasn’t "charbroiled" like the menu advertised (it seemed pan-fried?) and there was only one "tiger prawn". But to their defense, the menu does say "tiger prawn" and not "tiger prawnS"… Overall it was still a slightly above-average bowl of bun though, and the rest of the ingredients were all noticeably fresh – it just didn’t make as good an impression as the pho. Considering how busy the place was, the service, though unremarkable, was very efficient and courteous. it’s not the kind of service that you remember and makes you want to come back again and again, but the quality/taste of the food is what will bring you back… Plus, for the portion sizes, the prices were relatively cheap for Calgary. I’ve been to fair number of Vietnamese restaurants in Calgary (some good, some bad) and you definitely can’t go wrong with Essence of Saigon. Recommended. 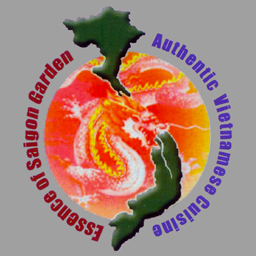 Essence of Saigon Garden was published on Sunday, January 20, 2013 at 12:11pm EST by Daniel Menjívar and last updated on April 11, 2018 at 9:30pm UTC .